My first visit to The Providores was not for food at all, rather, to sample an amazing selection of New Zealand wines. But, I’ve been back a few times since – sometimes downstairs to the buzzing Tapa Room and sometimes upstairs to the slightly more sedate but still relaxed, dining room. It’s somewhere I love. But, it is just a little awkward to reach for a South London gal, so not somewhere I go regularly. Owned and run by Peter Gordon and Michael McGrath it’s an old favourite that is anything but traditional. The menu is quite unique, a set of fusion dishes with some unlikely sounding flavour combinations that, at least for me, work every time. And, Europe’s largest selection of premium New Zealand wines. This time, for dinner upstairs, we managed to eat exceedingly well with a selection of memorable dishes which I almost feel obliged to go back and try again. My companion started with the Laksa of smoked Dutch eel, coconut and tamarind, green tea noodles, soft boiled quail’s egg and Scottish girolles. Laksa is a Peranakan (Chinese-Malaysian) dish of noodles in a spicy soup. Add a generous piece of smoked eel and a wonderfully soft boiled egg to the spicy base and you have an excellent dish that is richer than ramen but every bit as warming and comforting. Perfect for a cold winter’s night. For me, Grilled Presa Iberica pork with butter bean, vanilla and miso puree and salsa verde. 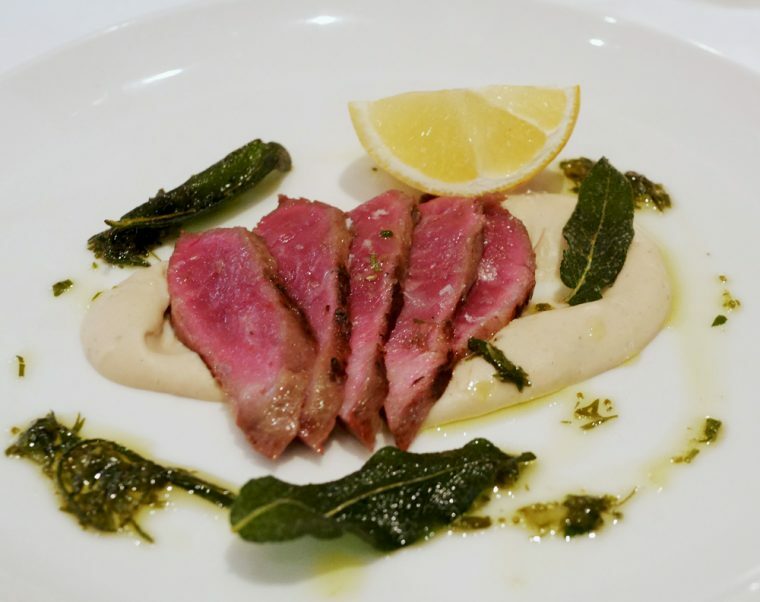 I rather enjoyed the fried sage leaves too – a lovely fragrant contrast to the soft bean puree. I was surprised to see this on the menu, a shoulder cut of pork that comes from acorn-fed pigs. It’s a meat known for a sweet buttery flavour. This one, 5J or Cinco Jotas comes from Jabugo and has been made by the same family for five generations. This is fusion food with an eclectic approach and such a careful attention to detail produces excellent results. I was only sad that there wasn’t more! Next for me, the Roast Creedy Carver duck breast. Again, careful sourcing of free range duck from Devon, that you’ll find on the menus in plenty of Michelin starred restaurants. 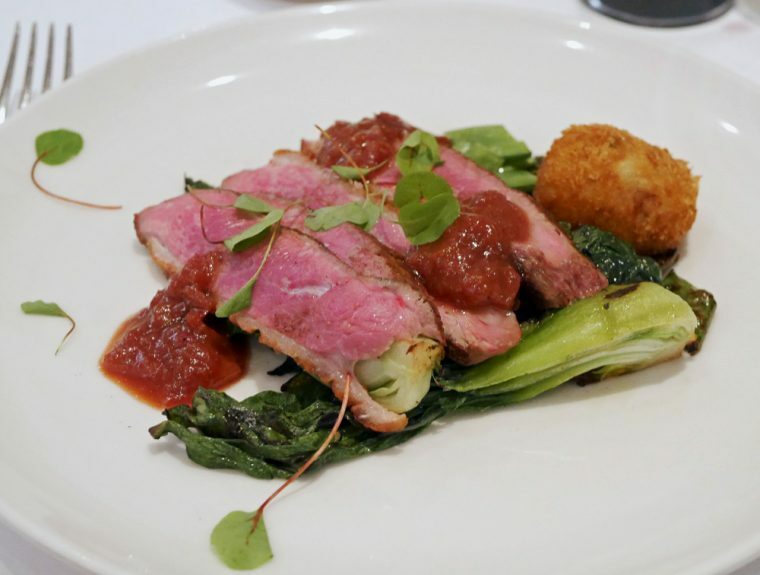 Served with spinach, bok choy, mange tout, plum sauce and a deliciously melting confit duck leg croquette, it was a perfect take on some classic flavour combinations. It was, however, my companion’s main course that we agreed was the overall winner for the night. 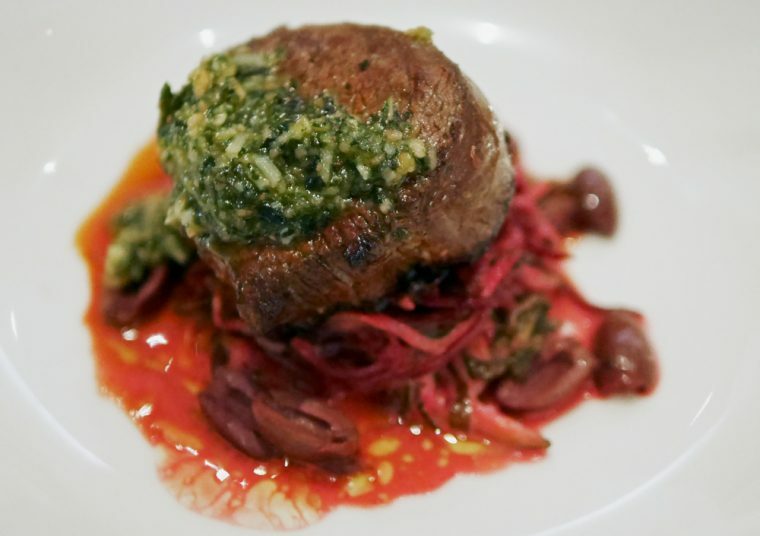 Beef Pesto is a Sugar Club classic and is made with a marinated beef fillet, warm chard, courgette and beetroot salad with garlic dressing, pesto and kalamata olives. In fact, it’s something I tried and raved about a couple of years ago when I visited the Providores and Tapa Room for a menu tasting event. It seems to be every bit as good as before. I’ve discovered that Peter Gordon, Chef Proprietor of The Providores and of Sugar Club in New Zealand has actually shared the recipe on Great British Chefs so I may just try making it at home. For dessert, we elected for the sharing platter of three desserts of our choice and asked the friendly waitress for her advice. She was entirely to blame for our unlikely choice of coconut yuzu tapioca with basil sorbet, lime, peppered almond praline and green mango. As every British adult of our generation knows tapioca, otherwise known as frogspawn, is a yucky kind of milk pudding only served by vitriolic dinner ladies on a mission for revenge. 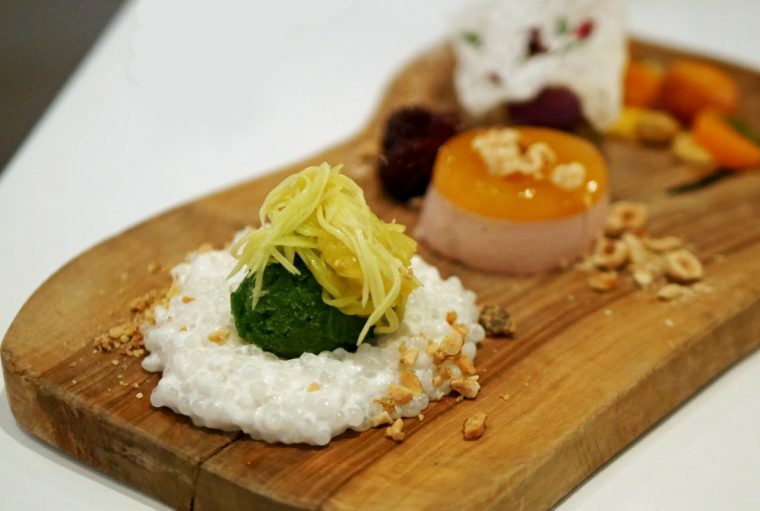 Except in the hands of Peter Gordon, where it somehow turns into a melting and delicious dessert, with the delicate basil sorbet cutting through the creamy coconut milk and the almond praline adding just the right amount of crunch. I was so stunned by the tapioca that I I have to confess I remember very little about our other choices, though I suspect that most of the Gulab jamun with mandarin curd, olive oil crumbs and purple rose ice cream ended up on my spoon, while my companion feasted on pomegranate pannacotta. We shared a bottle of Hawkes Bay Ash Ridge Syrah, 2014 which is listed at £34 on the Providores wine list and is something of a bargain at that price. It’s a rich yet fresh red wine with notes of blackcurrant, blackberry and pepper which paired very well with both the steak and the duck. Disclosure: On a previous visit to Providores, my scarf went missing from the restaurant cloakroom – perhaps taken in error by another guest. While Providores offered to fund a replacement, I had been so impressed with the meal that night I asked if the cash they’d offered could be in the form of a gift voucher for me to return and review the food. I’m delighted that my second visit in as many weeks was so successful and hope to return again soon. the food looks absolutely amazing. somewhere that’s been on the to-dine list for a while (but so much choice in London!) One of these days. 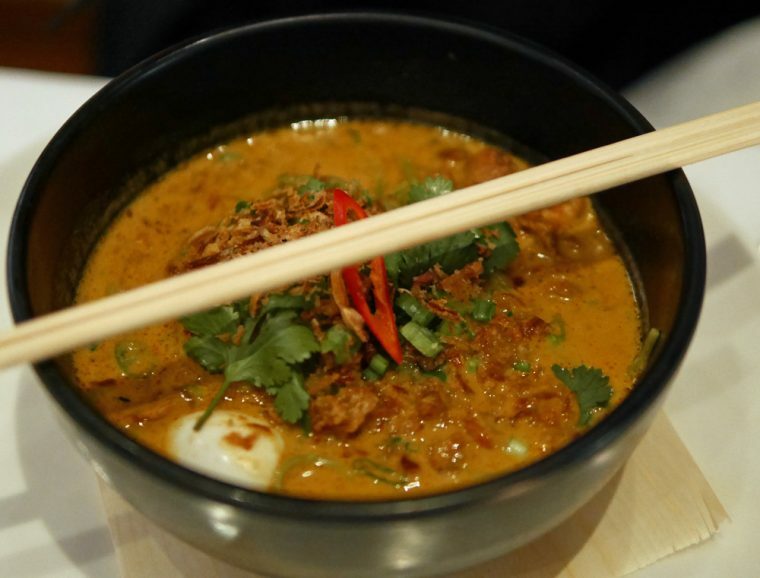 Wow, the pork and the beef look sublime and I LOVE the sound of that Laksa. We’re eating a lot of ramen in Melbourne at the moment but are heading to Penang in a few weeks so I’m excited to try lots of Laksa there. Will definitely seek this place out on our return to the UK! Very nice review. First I’ll say that your description of the dessert made my mouth water. As for the food, the Laksa looks delicious. I have yet to find a dish with duck that isn’t too chewy or rubbery tasting, but I imagine your Roast Creedy Carver duck breast would be it. It looks very tender. 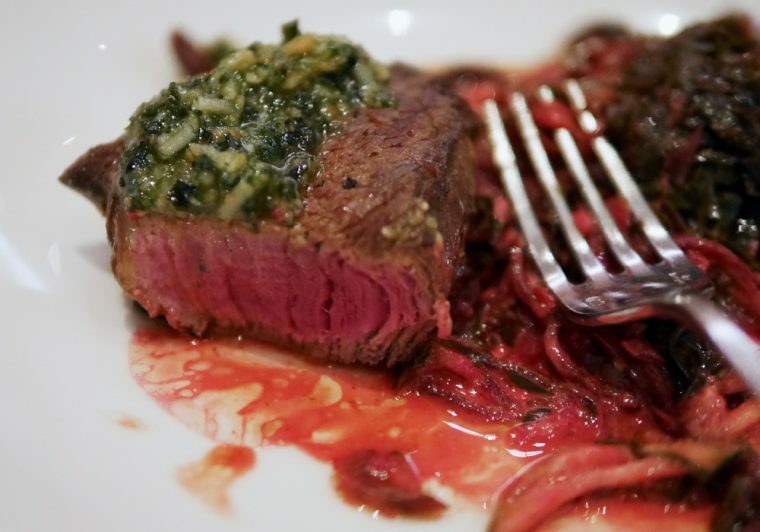 The Beef Pesto is cooked perfectly. The duck wasn’t in the least bit chewy – I know exactly what you mean, but this was spot on. The laksa sounds divine, I love smoked eel.